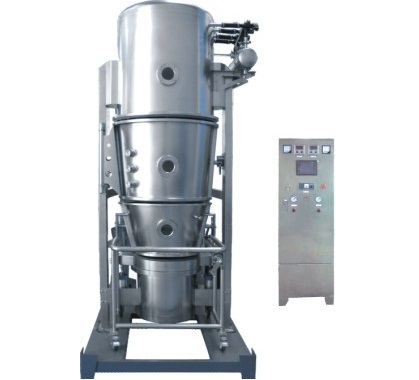 FBG Series fluid bed dryer & granulator is used in pharmaceutical solid dosage area for mixing, granulation and drying application, or drying of the wet granules processed from high shear mixer granulator. It’s the major processing equipment in solid dosage production line. The equipment is PLC automation controlled and well satisfies the current GMP and Pharmacy Code regulation. The inlet AHU consists of G4, F8, H13 filter and heater with accurate temperature control. The inlet air flow is variable controlled by the exhaust air fan motor VFD from the HMI. The main body structure consists of lower bowl, movable product bowl, fluidized chamber, expansion chamber/filter housing. The lower bowl, product container and fluidized chamber are inflatable silicon gasket sealed with compress air inspection sensor to assure the reliable sealing. The double structured bag filter in two pieces (in case request, stainless steel filter available) is inflatable silicon gasket sealed between the expansion chamber inner surfaces with compress air inspection sensor to assure the reliable sealing. A dust sensor is mounted on the exhaust piping and interlocked from control sys to secure the product safety during processing stage. The exhaust dust collection filter is optionally designed for protect environment. The 2bar and 10 bar powder explosion proof design is selectable to ensure the operator, equipment and environment safety with reliable grounding device. In case of fluidized granulation is requested, the binder solution tank and spray sys with peristaltic pump would be designed and offered. The binder is sprayed from the peristaltic pump through the spray gun into the chamber onto the product surfaces. The product coheres together by the binder which forms the binder bridge for form the core granules and grows up and formed. The binder bridge is evaporated away by the hot air and the evenly dried granules formed. The lifting tipping with on-line dry cone mill sys or, vacuum loading mounted on lifter with on-line dry cone mill sys is designed and offered to form the dust free material unloading from fluid bed sys to assure the dry sizing and clean production requirement according to current GMP regulation. The take in air is processed from the inlet AHU unit through three filters and heated, and blow up the material from its air distributor uniformly and dried by the hot air. In case of fluidized granulation, the binder is sprayed from the peristaltic pump through the spray gun into the chamber onto the product surfaces. The product coheres together by the binder which forms the binder bridge for form the core granules and grows up and formed. The binder bridge is evaporated away by the hot air and the evenly dried granules formed.